By Hagit Halali -- Prime Minister of Israel Benjamin Netanyahu addressed thousands of Jewish young adults from around the world this week. All of whom are currently spending time in Israel as part of Masa Israel Journey, a partnership between the government of Israel and the Jewish Agency. 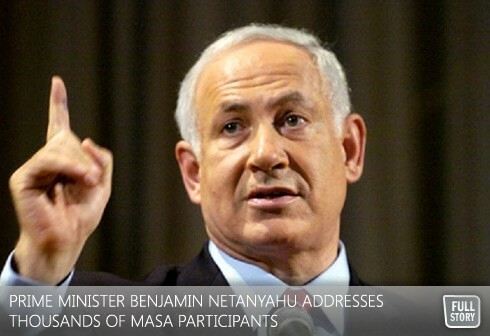 Netanyahu called on the Masa participants to stand up for Israel wherever they are – by making aliyah (immigrating to Israel) or defending Israel in their home communities. In Toronto, Masa is funded through UJA Federation of Greater Toronto. Later in the Masa event, Sharansky informed the audience that a Jew had been murdered earlier in the day in a Yemen marketplace solely for being Jewish. “We must do everything to protect the Jews of Yemen and Iran, and all the Jews of the world,” he said, adding that it is imperative that the young people take their future and that of the Jewish people into their own hands. Masa Israel Journey, a partnership between the government of Israel and the Jewish Agency, brings some 10,000 Jewish young people from throughout the world to experience Israel on long-term programs each year. The initiative is aimed at strengthening the connections between Israel and the Jewish world. Masa participants tend to return to their home countries even more engaged in Jewish life and Israel advocacy than they had been when they left, and many assume leadership positions in their communities. Many Masa participants—some 20 percent—elect to make aliyah.